I begin this blog with a photo of two men shaking hands: A Palestinian and a Jew. 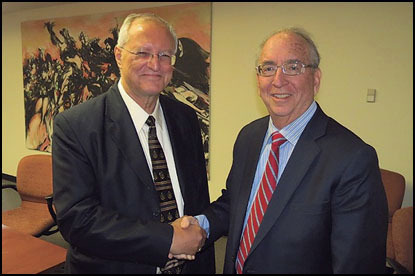 On the left Prof. Mohammed Dajani Daoudi, on the right Rabbi Dr. Ron Kronish. One the founder & director of the Palestinian NGO Wasatia, the other the Founding Director (now retired) of the Interreligious Coordinating Council in Israel (ICCI). "The Wasatia movement was created in January 2007 as non-governmental, non-profit, non-political initiative ... its declared goals are: To bring a deeper and more rational understanding of Islam to Moslems as well as to non-Moslems and to clarify the distortions to which Islam has been subjected ..."
"Our mission is to harness the teachings and values of the three Abrahamic faiths and transform religion's role from a force of division and extremism into a source of reconciliation, coexistence and understanding for the leaders and followers of these religions in Israel and in our region." I look at the above photo and I say to myself, "my God ... what is the problem in the Middle East? Why can't everybody be like these two elders: Smile, shake hands ... have your beliefs, tolerate, understand and accept one another and get on with life." The answer that always comes to mind is that those in power - those who pursue nationalistic & extremist agendas and thus stand in the way of peace - lack the level of wisdom and higher consciousness that is required for such a stance. But those in power (often) were elected into their positions, by you and me (that is what Krishnamurti would say; blog 803). When that is not the case, with the dictators of the world, they were at least tolerated, if not encouraged by our leaders. Bearing that in mind it is important to work toward an understanding in public discourse, i.e. in the media ... in its various forms, including blogs like this one. Indeed, the issue of education is paramount. The Truth is that - while we are not the same - all humans are equal; they all have the right to their way of expressing themselves, and anyone's life-stance is as valid as any other one (but conditions apply ... it must be tolerant & peaceful). Then, when that principle is applied and everyone has Peace, Freedom, Justice, Equality and Prosperity, the world will be a place where our children and future generations can live happily. The world we apparently are heading for would be in stark contrast: A desolate place, with a depleted environment and warring peoples, unaware and unconscious of The Truth, which is our one and only saviour.